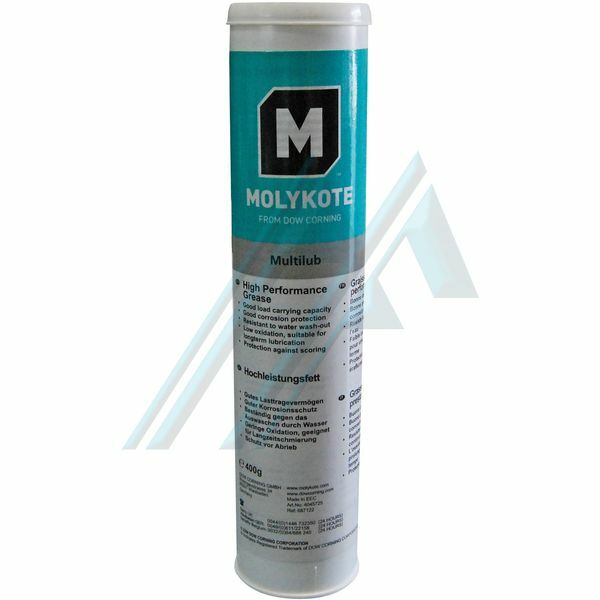 Home>Oils and lubricants>Lubrication and greasing>Oils and fats>Multi-functional grease>Grease Molykote MULTILUB 400 gr. Grease Molykote MULTILUB 400 gr. movements from slow to fast, medium load and high. in the presence of moisture. Used in bearings, plain bearing shells plain bearing, slides, guides, rollers, heads, shafts fluted spindle and threaded. Used for lubrication of chassis in cranes, forklifts and lifting devices. - Reduction of wear and scratches. Composition: mineral Oil, lithium soap, EP additive, corrosion inhibitor.